Yes, I missed Whole Foods. Even though they have a monopoly on the bourgeois central Connecticut area. Even though they cajole me into paying $30 for a pound of raw fish. Even though they have products with stupid names like ‘Paleonola’. I missed them. The Fresh Market in Arkansas just didn’t quite cut it for me. So today, after joining the gym, missing hot yoga, and cleaning my house, I decided to break my streak of responsible adultability and bought a $10 chocolate bar, #noregrets. 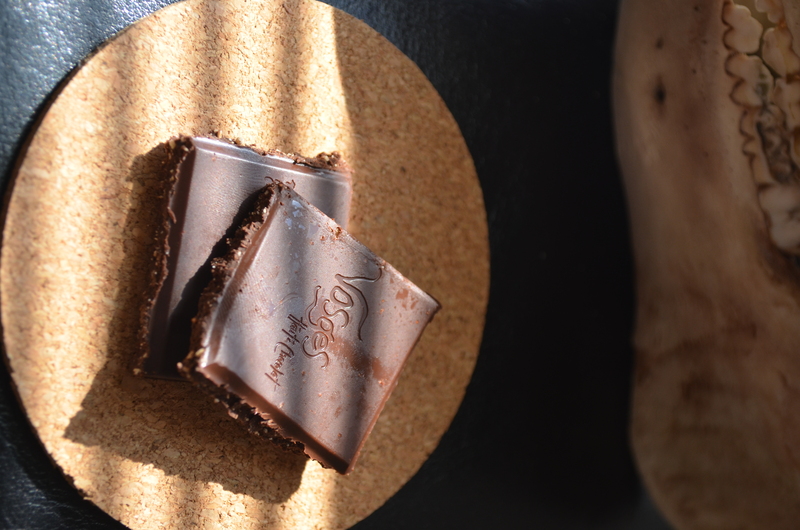 Vosges has been on my radar and palate for a long time, since the booming success of their bacon chocolate bar. While perusing the cheese section, I found a cheese-infused chocolate bar- a Whole Foods exclusive, with aged parmesan cheese and tellicherry peppercorn. 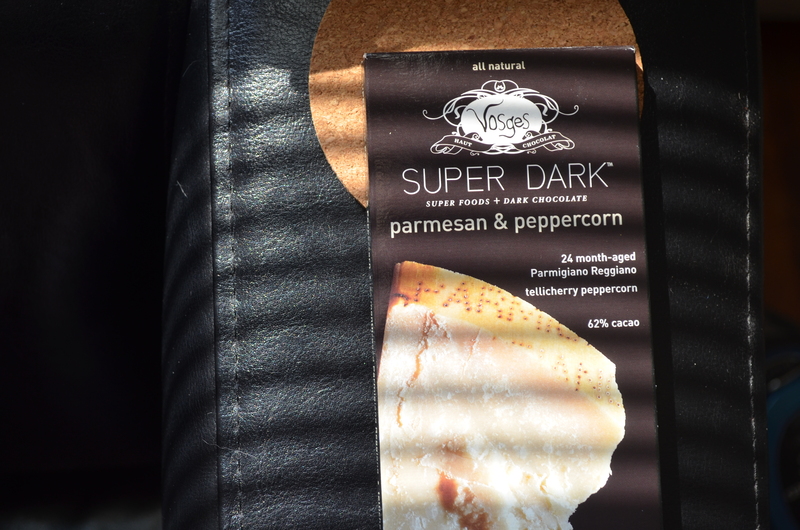 This is part of the Vosges Super Dark line, which uses superfoods and dark chocolate to create clever flavor pairings and allow the consumer to pretend they’re eating well after sweating to Giada’s breasts at the gym. Not that I did that or anything. This particular bar has 72% dark chocolate. It was in the refrigerated section, vaguely cold, near the cheese in the market, but when I got home five minutes later, I found the bar to be oddly soft and malleable. Given the low cocoa fat content of dark chocolate, this was an unusual physical characteristic and gave the chocolate more of a ganache-like, gooey texture than the typical snap of dark chocolate that I expected. 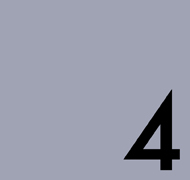 I’m not sure why this is. With that bit of heat, the chocolate was accentuated to a ridiculously overwhelming degree. Not to say that it wasn’t good chocolate, but the natural salinity, grassy flavors, and hints of coffee in the base really detracted from what I expected to be the main attraction, the cheese. That being said, the peppercorns were a delightful addition. Peppercorns are no stranger to chocolate, and when they’re too large, they can add an annoyingly spicy rush or odd, synthetic crunch to each bar. These were finely ground and allowed for a pleasant pepper and spice flavor without feeling too bulky within the composition of the bar. For $10, I’d expect to see a better balance of the main ingredients, especially with the cheese so prominently displayed. To me, this more resembles the diffusion Wild Ophelia bars than the haut Vosges standards I’ve come to expect from the company. A cocoa bean has 50% or more fat lipid content. I am also presuming that this bar has additional cocoa butter added to it. So unless the cocoa used in it was defatted it is not unusual for it to be “soft and malleable” with a “gooey texture” exacerbated by Vosges’ usual shoddy technique of not fully suspending all the particulates (inclusions included) in the refining process because, again, Vosges really does not refine, they just assemble stuff into clumsy clumps. Your tasting notes tell me that the cocoa beans are bulk grade subjected to a poor and uneven roast to suit. In truth Vosges is a spinster hag parading as haute chocolate. Kevin, you brilliant, amorphous thing, be the Sherlock to my Watson. I’m inclined to agree with you on all points- my susceptibility to marketing from them has yielded some marvelous finds, most notably their caramels, but for the most part, their inconsistency cannot justify the high price tag. Also notable is a distinct lack of ingenuity in the field- I read Katrina’s innovation blog and am often disappointed to see that bars like tobacco and banana go down the experimental tubes while WF/FM exclusives combine the ubiquity of bacon time and time again. What gives? Chocolate Econ 101: the entire value chain, even at the boutique end of the spectrum, is based on volume / scale. Vosges has a big operation to feed. Unless a bar appeals to the mass market it will not make the cut for mass production. And now with instant digital social-media focus-groups, products can be tested before they are even created by floating concepts online to gauge the potential market for them. I suspect Katrina was phishing her tobacco banana bar that way. Which leads me to propose that we hatch a white chocolate with seaweed and curdled blood. Let’s get on it- I second that and propose we package it with Etat Libre d’Orange’s Secretions Magnifiques for added sensory stimulation.